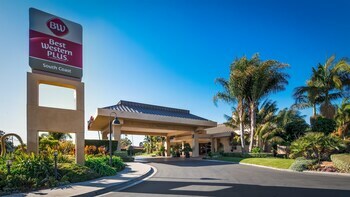 When you stay at Best Western Plus South Coast Inn in Goleta, you'll be by the ocean, within a 15-minute drive of University of California-Santa Barbara and Presidio Santa Barbara. Featured amenities include complimentary wired Internet access, a 24-hour business center, and limo/town car service. A roundtrip airport shuttle is complimentary (available on request), and a train station pick-up service is also provided at no charge.